Germany's trains are some of the cleanest. fastest, and most comfortable trains in Europe; it's a joy to ride them. They transport you right to the center of many of Germany's most compelling cities and towns, from must-see Berlin and Munich to smaller towns like Trier and Dresden. For travel between cities, trains offer the best alternative to car transportation. You won't spend half your vacation time looking for parking spaces and worrying about your rental car being broken into. 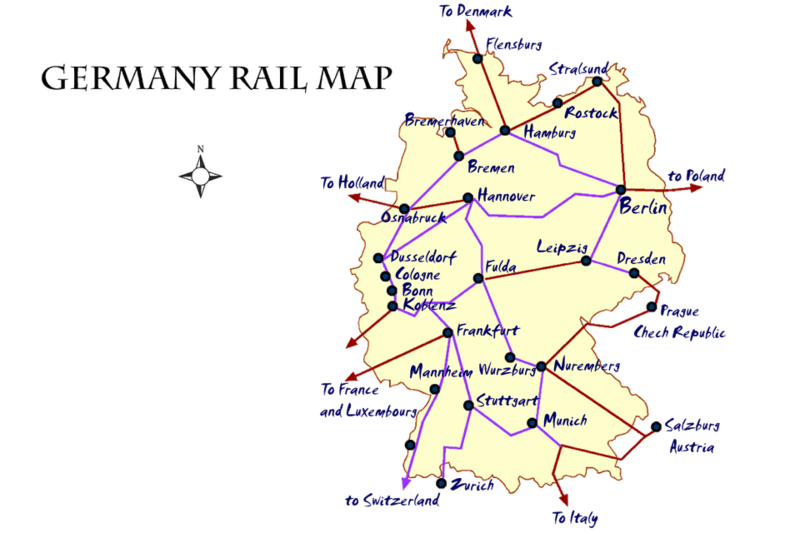 The train map below shows the major rail lines in Germany. The purple lines on the map indicate the high-speed rail lines, suitable for Germany's fast Inter City Express or ICE trains, which are capable of traveling over 200 miles per hour. If you've never traveled by train in Europe before, you might want to check out Ten Tips for traveling Europe by train. It outlines many of the procedures that are common for European train travel but seem to baffle those who've not grown up with the system. See also: Interactive Rail Map of Germany Plan your itinerary and get ticket prices and travel times. The best website for looking at rail ticket prices is Rail Europe. One way to save on tickets is to take advantage of a time when the trains are used less by locals. Weekend Tickets are often heavily discounted. The Quer-Durchs-Land-Ticket offers a day pass ticket good throughout the German rail system that gets cheaper as you add passengers traveling together. These days there are special considerations to be given before buying a rail pass. First of all, keep in mind that rail passes don't always save you money. The key is to use your rail pass days for longer trips on faster trains. It's a good idea to plan your trip with several "hubs" from which you'll branch out, using your rail pass to get between each hub, then using point-to-point tickets or even buses (or coach tours) to day trip destinations near your hub. That said, with good planning you can save a lot of money on Germany's relatively expensive trains by the judicious use of a rail pass. Find the pass that's right for you on Rail Europe: German Rail Passes (buy direct). Various youth passes can save student under 26 years of age lots of money on train travel. The high-speed trains use the routes in purple on the map. The German high-speed train is called ICE for InterCityExpress. They travel at speeds up to 250 km/hour quite smoothly. There are tables with electrical connections for laptops. It's a good idea to get a seat reservation on an ICE train. There is a supplement that you'll pay for these speedy trains, but then again, second class on an ICE train is often better than first class on some other train lines. City Night Line trains are making a comeback. They take you on some pretty compelling tourist routes, including Amsterdam to Copenhagen, Munich or Prague, Berlin to Paris, and Munich to Venice or Rome. See: Night Trains in Europe.